Should High Stakes Poker Switch to a Mixed Game Format? As you may or may not know, High Stakes Poker has been looking for ways to increase the popularity of show. They have added young, mainly online players to the mix. They have told "boring" players on the show that they won't be invited back. And midway through this upcoming season, they allowed for the minimum buy-in of the game to be substantially increased. One potential change that would be sure to dramatically increase the watchability and volatility of the games would be to introduce a mixed PLO / No Limit Hold'em format to the show. If you want to increase the average pot sizes and have multiple people bust throughout the entire season, then introducing Pot Limit Omaha would be the logical choice. I am sure that most of the pros would agree to this, as most of them play Pot Limit Omaha just as much, if not more than Texas No Limit. I guess the only reservation on the part of High Stakes Poker producers would be that some of the viewers might not be familiar with the game of Pot Limit Omaha. 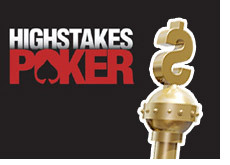 However, what better way to introduce them to the game then to feature it on High Stakes Poker? You could play ten hands of No Limit Hold'em, and then ten hands of Pot Limit Omaha, and alternate back and forth. People want to see the big pots. They went to see hands like Hansen vs. Negreanu. What better way to generate huge pots than to have a bunch of rich poker players playing Pot Limit Omaha as well as No Limit Hold'em? It's just a thought, but I am sure it would go over well with the pros at the table plus the fans at home.